It’s been a very busy and enjoyable couple of weeks! The Triskele Litfest 2016 took place at LIFT in Islington last Saturday 17 September. It was an outstanding event which was extremely well run. The organisers did a great job. I met so many interesting and lovely authors. The author panels were informative and entertaining. I learnt such a lot. I’ve gained so many writing tips which I shall now try and put into practice! I was sharing a table at the Pop-Up Bookshop at the Litfest and we had been asked to bring a table covering for our half of the table. I decided to take one of the hand tufted rugs that I had made. 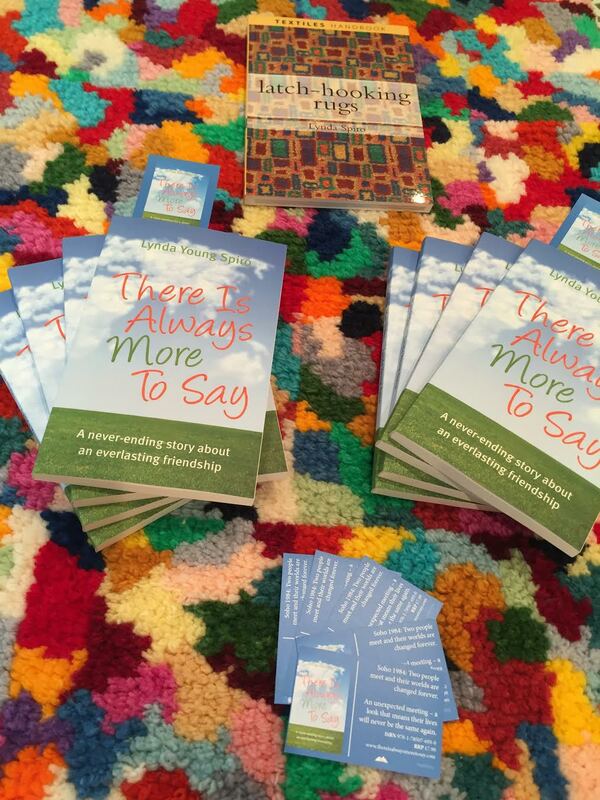 So armed with some copies of ‘There Is Always More To Say‘ and the rug I was all sorted and ready to go. But literally just as we were about to get into the car my husband asked why I wasn’t taking a copy of ‘Latch Hooking Rugs‘. A book that I had previously written and which was published in 2008 about the techniques of hand tufting rugs. It was a good idea of his. And, of course, I took one. It was a really great day and I can’t wait until Triskele Litfest 2017! This week I also enjoyed chatting with Isabell (@DWOE_REVIEWS) who interviewed me for the author spotlight post on her blog, the beautifully named Dreaming With Open Eyes. Isabell asked some great questions and you can read the interview on the link provided. Thanks, Isabell. Again I feel the need to say how appreciative I am to all of the people who have so kindly agreed to read and review ‘There Is Always More To Say’. I am seriously overwhelmed. Please take a look at the link which will take you to Jill’s Book Cafe (also a lovely named blog) where you can read the review. Thank you Jill (@Cheshire1958) for such a great review.